When tearing down a structure that spans a body of water, it is important to consider both the safety of the process as well as the possibility of any environmental impact. Brennan has both the equipment and experience necessary to mitigate these potential risks. Our floating marine plants can support the equipment necessary to do the job right and our skilled teams have the experience to systematically demolish a structure while limiting any environmental impact. We are a resource to the railways. Count on Brennan to provide bridge construction and repair services, culvert installation, underwater surveys and more. 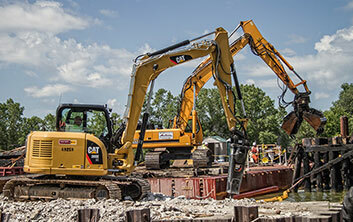 For more information please download our Railroad Construction Brochure. Want more information on our demolition services? Please fill out the form below!